One Ticket purchased entitles one person entry to the arena on a single occasion for the stipulated game. All persons entering the arena must hold a valid ticket that must be retained at all times and submitted for inspection if required by any member of staff or stewarding team. Failure to produce a valid ticket on request may result in removal from the arena. This includes tickets shown on a smartphone. Where ticket prices vary according to age, the following provisions apply: A person aged 22 years to 59 years is classed as an Adult; A person aged 60 years and over is classed as an Older Person; 16 to 21 years, Student, Carer, or Disabled is classed as a Concession; 4 to 15 years is classed as a child and for children aged 3 years and under no admission fee will be charged, providing they sit in the lap of an accompanying adult. **Please note if you purchase a Concession/Child ticket, it is your responsibility to carry the appropriate ID for inspection on entry. If you have insufficient ID, you will be asked to pay the Adult ticket rate before entering the arena. Once acquired, whether by purchase or on a complimentary basis, tickets are non-refundable and non-transferable to alternative games. If a game is canceled or abandoned and must be re-scheduled, the ticket for that game is automatically transferred to the re-scheduled game. No refunds will be offered. This includes games re-scheduled because of issues with the ice, the arena, severe weather conditions or travel problems for the participating teams. Pre-booked Tickets should be collected from the entrance on the right-hand side door of the arena. Persons wishing to redeem pre-booked tickets must be able to produce to the arena staff the following items: The booking reference issued when tickets were booked; and the payment card used to pay for the tickets. Flexi vouchers can be exchanged for match night tickets at the box office are subject to availability. Your season ticket entitles you entry to all home league games (28) and all home challenge cup qualifying round games (3) – 31 games in total. Your season ticket card must be presented to the stewarding team to enter the arena. If for any reason you arrive at the arena without your season ticket card, you will not be allowed entry. If you lose your season ticket card you must notify a member of staff as soon as possible, either by telephoning 0161 926 8782 or emailing [email protected]. You will be required to pay a £10 replacement fee for your season ticket. If you are unable to attend a game, you can allow another person to use your season ticket providing they have your season ticket card to present on entry to the arena. If the season ticket card is not the correct ticket type of the person attending, (for example, an adult is using a child season ticket card) then an upgrade fee must be paid at the box office and a receipt obtained, to present to the stewarding staff on entry to the arena. Children 15 and under must be accompanied by an adult over the age of 18. We reserve the right to deny access to enter or re-enter the arena. A variety of special effects (including sudden loud effects and strobe lighting) may be used in areas of the arena throughout match night. It is recommended that visitors with high blood pressure, heart conditions or other pre-existing medical conditions ask staff or members of the stewarding team for further details. All visitors should take their assigned seats and not stand to watch the game, unless a standing ticket has been bought. All visitors should stay in their seat while the puck is in play. Visitors may be held in specific locations, if they are moving around the arena, until the puck is out of play. From time to time staff may draw visitors’ attention to certain health and safety procedures to which visitors must adhere. A smoking area is provided during period breaks only, exiting the arena through the fire door entrance on the ground floor and is subject to availability. You are required to have a valid game ticket to exit into the smoking area and re-enter the arena. Manchester Storm reserves the right to refuse entry to or expel from the arena any visitor who fails to observe the prohibitions of the conditions outlined above or whom we consider likely to affect the safety or enjoyment of any other visitor through the use of abusive or foul language and behaviour. Doors open an hour before face-off. As part of our recent security reviews, security checks will be undertaken on entry of all handbags & rucksacs. Please allow yourself sufficient time to enter the arena and we thank you for working with us to ensure your safety at our events. Visitors must keep their personal belongings with them at all times, and Manchester Storm accepts no responsibility for loss, theft or damage to any personal belongings brought into the arena. No food or drinks purchased outside of the arena are permitted to be brought into the arena for consumption on match night. Flash photography is prohibited while the game is in play. From time to time Manchester Storm or oauthorizedrised third parties may carry out photography or other recording within the arena and any images or recordings may feature visitors. 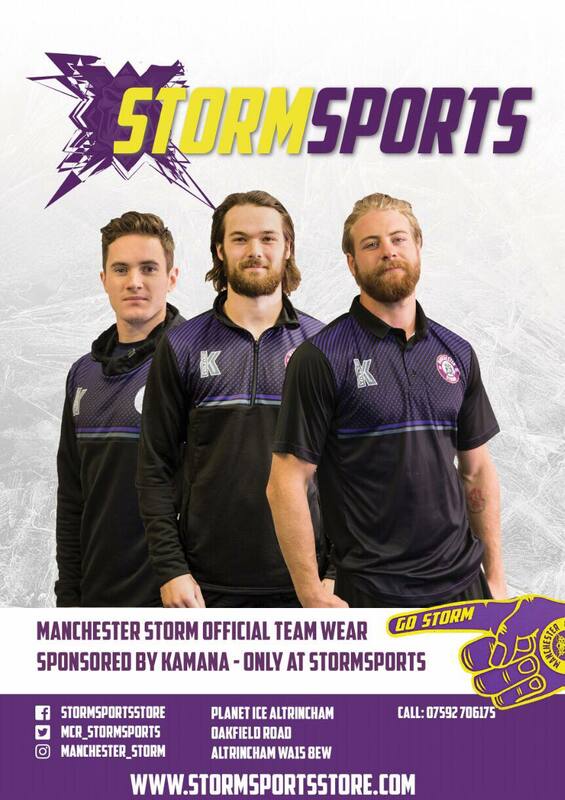 Visitors consent to the use of such images by Manchester Storm in connection with advertising, promotions or monitoring and acknowledge that the copyright in such images rests with Manchester Storm and/or any authorised third party.